Still struggling trying to find gifts for your employees, faithful customers or even for yourself? 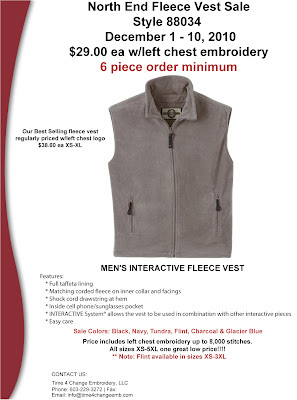 Our bestselling fleece vest style 88034 from North End is on sale now until Dec. 10, 2010. Colors on sale are: Black, Navy, Tundra, Flint and Glacier Blue. All sizes one great low price of $29.00 w/left chest embroidery up to 8,000 stitches. And low order minimums! What a great way to say thank you by helping to keep your employees warm and comfy in the winter months to come. 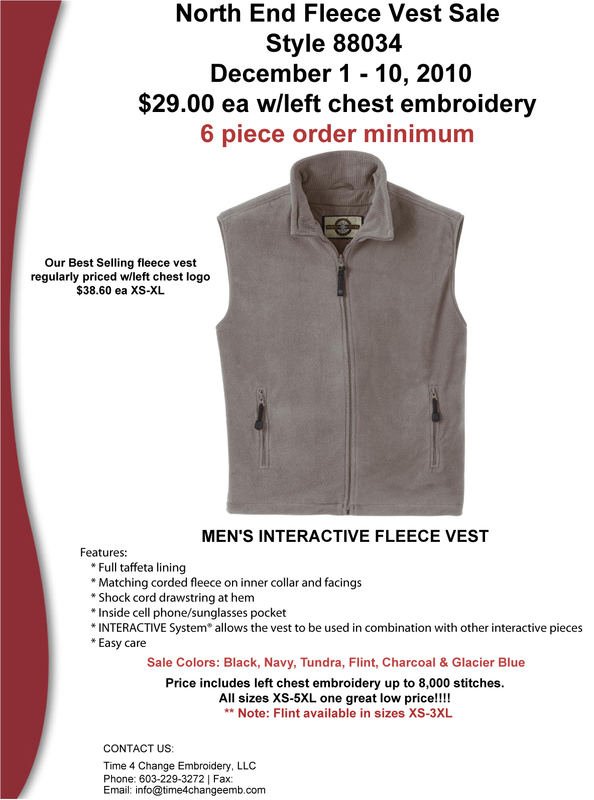 Not only are these fleece a high quality product, they are completely lined for easy on, easy off. We currently have samples here at the store if you would like to see this item. To view more information on this product please go to http://www.stylesac.com NOTE: Alpine Green and Molten Red are not on sale. Questions, please call, e-mail or stop on by!